Detail, Cat Rabbit, Eggs Writ Large, 2017, wool roving, wadding, cotton, cardboard, polyester stuffing, calico, 800cm x 800 cm each. Image courtesy the artist. 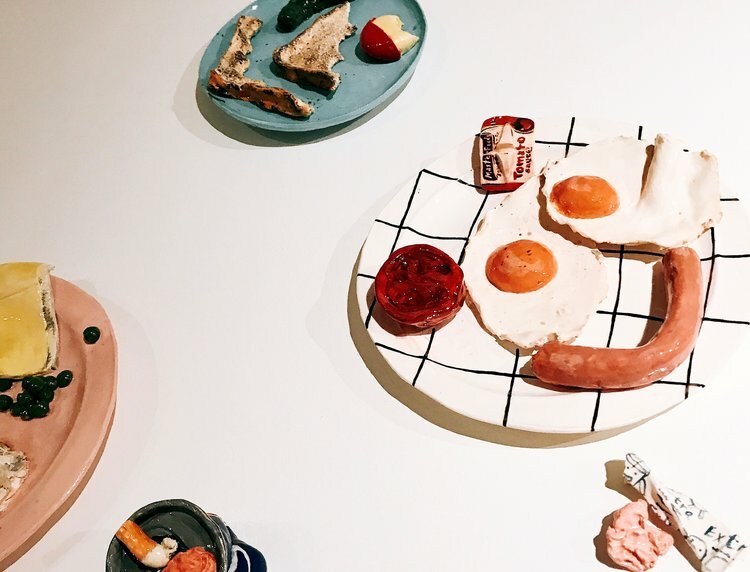 Installation view, Mechelle Bounpraseuth, Slice of Life, 2017, Craft, Melbourne. Image courtesy Craft. 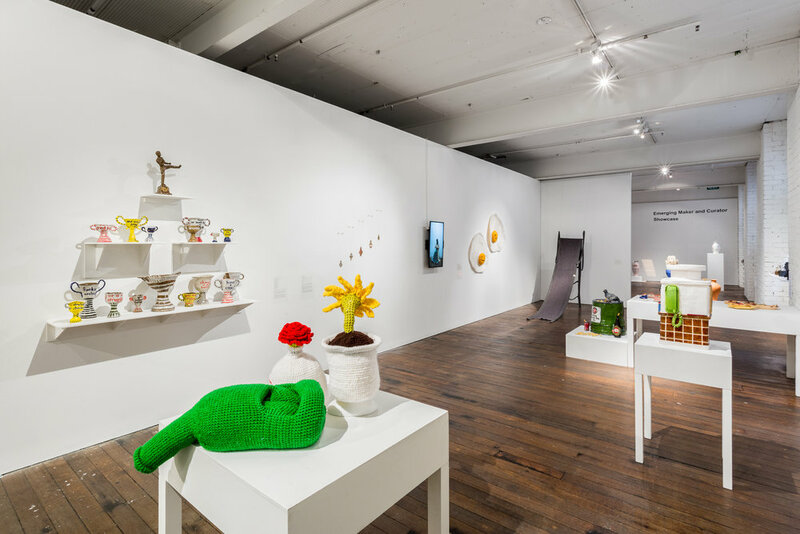 Slice of Life was a group exhibition curated by Sophia Cai that examines a contemporary approach to everyday objects and still lifes through craft-based practices. The exhibition will featured works by Mechelle Bounpraseuth, Julie Burleigh, Scott Duncan, Phil Ferguson (Chili Philly), Katie Jacobs, Josephine Mead, Tricia Page, and Cat Rabbit. The artists work across diverse mediums including ceramics, textiles and jewellery to playfully depict natural and man-made objects to create familiar scenes from unexpected materials. This focus on ordinary scenes told through handcrafted works highlighted the inspirations found in the everyday, and re-imagined our personal relationship to objects, history and nature. Slice of Life was one of the first exhibitions taking place as part of Craft’s inaugural Emerging Makers and Curators Program, an initiative designed to showcase the work of exciting new talent to a wider audience. It provides key professional development opportunities, acting as a vital stepping stone for emerging makers and curators supported by the expertise and profile of Craft. Following an open call for expressions of interest, the final selection of artists and curators was made by an advisory group of external experts including artists Kate Rohde and Marc Freeman.